Data doesn’t mean anything on its own—it has to be interpreted. Programming is about creating and composing abstractions. Models are for computers, and views are for people. Better algorithms are better than better hardware. The tool shapes the hand. Until I do that, let’s take these in order. First, and most importantly, it’s all just data. Shopping lists, email, pictures of far-off galaxies: inside the computer, they’re all just ones and zeroes. Even programs are just data: in fact, this is the key insight that all of modern computing is built on. The source code for a program is just a bunch of text files, no different from a thesis. Once that text is compiled or loaded into memory, it’s just bytes too, and pushing those bytes around is no different from correcting a typo in an address list or changing the color of a pixel in an image file. If you understand this—if you understand that programs are just another kind of data—then every bit of programming you do will be easier. The second idea is a complement to the first. Data doesn’t mean anything on its own—it has to be interpreted. The thirty-two bits 01100100011000010111100001100001 are simultaneously the word ‘data’, the integer 1,684,108,385, the floating-point number 1.6635613602263159e+22, a bluish-gray pixel that’s slightly transparent, a medium-loud sound sample with slightly higher volume in the left channel, an instruction to copy the content of register 100 (out of 128) to a location in memory that’s 97 bytes past the address currently stored in register 116, or a point near the outer edge of one of the superconducting magnets in a CAT scanner if the file those four bytes are in is a CAD model. A machine doesn’t; it doesn’t even see four blobs of blue pixels on a gray background, because it doesn’t “see” anything. The computer stores this image, and a program, as bits in memory. If those bits happen to correspond to instructions for the computer’s CPU, and if those instructions happen to make up a program for detecting shapes in images and matching those shapes with letters in the alphabet, then the computer may very well output “data”, but it doesn’t understand. Calling a variable “temperature” doesn’t mean the computer will store a temperature in it—it would do exactly the same thing if the variable was called “pressure” or “frankenstein” or “a7”. This brings us to the third idea: programming is about creating and composing abstractions. Our brains can only keep track of a few things at once, so if we want to understand something, we have to stuff the details into boxes and put labels on them like “find the maximum” or “patient record”. One key to making abstraction work is to separate interface and implementation. An interface is what something knows how to do: the questions it can answer, or the operations it can carry out. Its implementation is how it does those things: what data it stores, what algorithms it uses, and so on. There can be dozens of ways to implement a particular interface; if we do our work well, we shouldn’t have to care about the implementation until something goes wrong or we need to improve its performance. “Spare me the details” may be rude in real life, but it’s essential in programming. Another key to making abstraction work is to always choose clarity over cleverness. As Brian Kernighan once said, “…debugging is twice as hard as writing a program in the first place. So if you are as clever as you can be when you write it, how will you ever debug it?” Programs are among the most complex things human beings have ever created; it may be tempting to use little tricks here and there to make them smaller or faster, but somebody (maybe you) is going to have to figure it out again later, and really, nobody likes being tricked. That model can be rendered in a browser, turned into speech for someone who is visually impaired, or displayed as text using angle brackets, quotes, and some indentation. None of these is the model: they’re all views that make the model’s content accessible to human beings in different contexts. The model itself isn’t just easier for the computer to work with: it’s essential, since as we said before, the computer can’t “see” the views that we create for human beings. 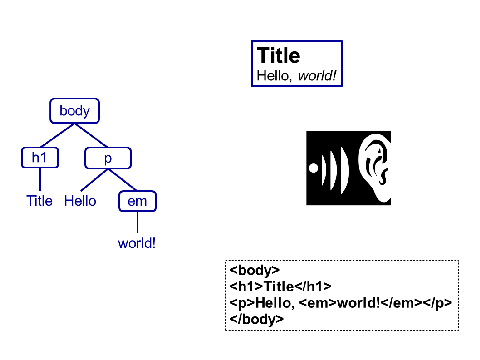 Turning one of those views back into a model is hard: parsing the textual representation of HTML takes thousands of lines of code, and doing OCR or speech recognition to translate the rendered page or its spoken equivalent can take millions. What big idea number four implies, therefore, is that structured data is better than unstructured data. The tags and attributes in the textual representation of an HTML page are there because without it, the computer can’t tell whether something is in italics because it’s being emphasized or because it’s the title of a book. To borrow an example from Jon Udell, a PDF with a cartoon whose caption says, “The knitting circle meets on the second Tuesday of every month” is a lot easier for human beings to understand than a blob of iCal-formatted text, but the second is much easier for the computer. We said earlier that we only want to care about how something is implemented when things go wrong or when we need to improve its performance. Big idea number five is about things going wrong, and can be summed up by saying that paranoia makes us productive. The best way—in fact, the only way—to improve productivity is to improve quality, and this starts before we write the first line of code. “I want to count all the stars in this photograph” is easy to say, but what does it actually mean? What constitutes a star? When do you decide that a lumpy blob of pixels is two stars rather than one, or three instead of two? Every program embodies decisions about questions like these, even if you don’t realize that there was a question and that you made a choice. The sooner we worry about this, the less time we’ll waste building the wrong thing. Of course, we don’t stop worrying once we’ve typed our code in. We check that data is formatted properly to protect ourselves against “garbage in, garbage out”. We put checks in our code to make sure that parameters are sensible, data structures consistent, files aren’t empty, and so on. And we write tests, and use a build system, to catch errors as soon as possible. This might feel like it’s slowing us down at first, but study after study has shown that it works. One of the best ways to apply this principle, by the way, is to automate everything. As Alfred North Whitehead said, “Civilization advances by extending the number of important operations which we can perform without thinking about them.” We don’t just write programs because we want to do things quickly: we write them because we don’t want to do some things ever again. Version control systems keep track of our work for us; spreadsheets update graphs and summary statistics whenever a single value changes, and so on. Every time we automate a task, we reduce the chances of getting it wrong the next time, and have more time to think about things that machines can’t do for us. And it’s not just a one-time saving: if we automate things well, that extra time is ours over and over again. Big idea number six is that we can think about how fast the algorithms embodied in programs are, and that better algorithms are better than better hardware. One of the greatest mathematical advances of the Twentieth Century was the idea of algorithmic complexity, and its practical implications shape everything we do with computers, whether we realize it or not. The basic idea is that we can estimate how many operations an algorithm will do, or how much memory it requires, as a function of the size of the problem we’re trying to solve. It turns out that some algorithms slow down gently as their inputs get larger, while others slow down so much that even if the whole universe was one large computer, it couldn’t solve any problem big enough to be interesting. Faster chips help—a lot—but the real key to speed is to focus on what we’re doing, not what we’re doing it with. But algorithms are nothing without data structures to operate on, just as data structures are pointless without algorithms to manipulate them. That’s why the two topics are usually taught together: arrays with loops, trees with recursion, and so on. Knowing the syntax of this language or the API of that library is useful, but good programmers know their data structures and algorithms the way a plumber knows pipes or a musician knows scales. Our last big idea is something that artisans have known for thousands of years: the tool shapes the hand. Building software changes how you use software; making computers do new things changes your understanding of what computers can do. That’s why any course about computational thinking should ask you to write software: however frustrating it may sometimes be, it’s the only way to teach you what software can do.